80mm x 40mm (smaller than a credit card). 86 programmable IO pins on 11 molex 2mm connectors. 2-wire Serial Interface More features detailed in the Atmel ATmega1280/2560 datasheet. "Drive up to 16 RC servos!" 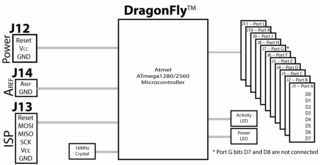 This ATmega1280 based microcontroller board features 128K of flash for your most demanding applications. Measuring only 80mm x 40mm, the board is smaller than a credit card and two of these boards can fit in the palm of your hand. We pinned out all 86 of the IO pins on this chip. The board features an on-board 16MHz crystal. 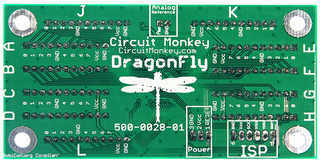 The board is powered by either an external 5V or 3.3V power source. It features a 6-pin ISP RobiCon connector for programming (adapter included) as well as a Molex 3-pin power connector (the third pin is reset). 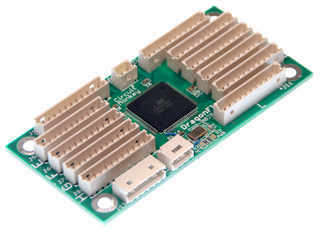 Drive up to 16 RC servos with this board. Perfect for Robotics, Hexapod. 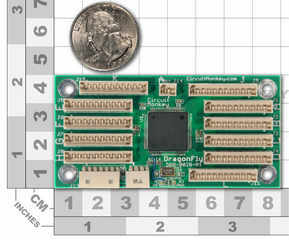 The "Naked" version of this board (no connectors soldered in) makes this board ultra thin and lightweight, making it perfect for UAV development. We have a bundle that makes this board software compatible with Arduino Mega (which uses the ATmega1280 chip). Our bundle includes the board with Arduino firmware already loaded as well as a USB/Serial adapter and three 11-pin I/O cables. 11-pin/2-pin Breakout Board This board is also available in a "Naked" Edition, lighter, thinner, and no connectors soldered in.